Your guide to reader recommendations and resources. 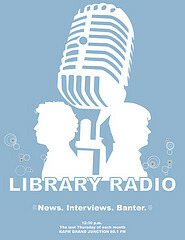 Listen to KAFM 88.1 the fourth Thursday of the month, 12:30 p.m to hear the latest library happenings. In the mood for a book, but just don't know what to read? Mesa County Libraries can help! Some of these resources are subscription-based, so you may need your library card number to use them from outside the library. Find tons of information about books and authors, including series lists, read-alike lists and other recommendations, discussion guides, and more. Excellent source of biographical information including websites, magazines and news. A comprehensive database that provides information on over 5 million book titles, in a wide range of formats. BIR also contains almost 800,000 full-text searchable book reviews from the sources that you trust: Library Journal, School Library Journal, Publishers Weekly, Booklist and others.